Come the Winter of the North Country, the heart and soul turn to home heating. There are pellets and fire-wood to be delivered and stacked and some to cut and split. And un-known to many, there are proper methods and ways to stack them, safely and securely and conveniently too. Then there are the places in which to burn what-ever it is you choose to give warmth… stoves, pits, fire-places, the likes and un-likes. The choices are many but here, in particular I’ve built the back-yard “fire-pit” using the steel wheel from a tractor and some old bricks found lying in the yard during a clean-up. 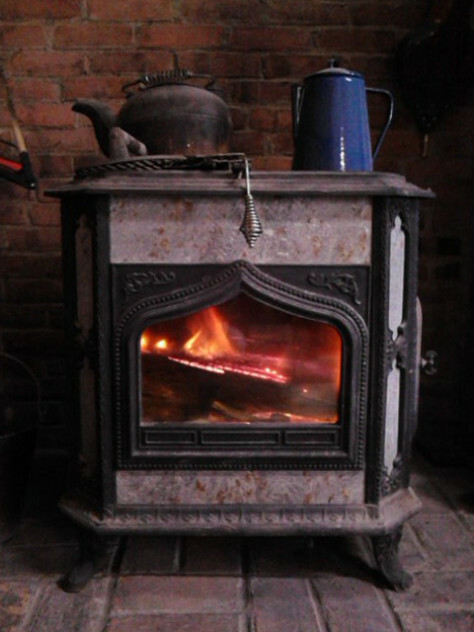 Wood-stoves, nice as the are, need routine cleaning. It’s a bit of a messy chore, but the result is a much warmer house as well as cleaner burning. On the “Portfolio” page, tonnes of pellets stacked neatly in the wood-shed, cords of wood properly stacked in the yard and in the garage. The little fire-pit in the yard and the wood-stove in the kitchen.